I little bit ago I posted here about a save the date idea. You guys gave me tons of great feedback so I tried to use what you told me and came up with another idea I want feedback on! The font is a little fuzzy and there is a random green thing in the corner because I just took a screen shot of this while I was working in picnik. But besides that, what do you think?? Better than the last one? Let me know what you think! Thanks ladies!! The post card idea is great. Plus, postage for post cards is less than a normal envelope. I don't know if you would want to fancy them up with a cute envelope, but I've gotten a few as post cards and think they are so cute! Your design is awesome. I think you should use the one that uses your wedding colors. I like this new one lots better. I love the first one. Use that! I like the picture from the first one, but the color and font of the second one...I don't know if that's much help at all! I love them both, so hard to chose. But its nice that the wedding colors are now included in the new one! SO cute! I still really like the first one but I do like that you incorporated your colors into this next one. Either one they are a fab idea! Very cute Becca! I especially like how your dress coordinates with the wedding colors! i love the picture of the second, but the design of the first. the wedding colors would be a nice incorporation too. can you do the second picture in color possibly?? I like both! Here's a thought (that you didn't ask for!) - I love the sepia RR photo - what if you added color just to your pink/purple dress on that one? Or something like that. The RR track photo is just so timeless, though the new one is simply adorable. Whichever way you go, it will be great! 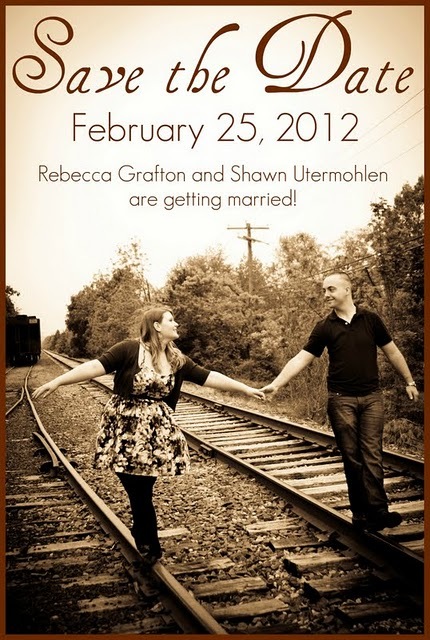 Gotta say one more thing, I know it might be cool to color coordinate your save the date/invitations/etc with wedding colors, but if I were a guest, I would not remember and think - hey, their save the date was in sepia and did NOT color coordinate with their wedding color scheme! If I were you, I would go with what is most YOU and your fiance. You're charming, creative, and an all-around classy, modern girl, so it'll be great!